Concrete pavements – a boon or a bane? 1. The pavements are not used by pedestrians at all. The streets in the locality have sparse vehicular and pedestrian traffic. Pedestrians walk on the edge of the road comfortably. The picture below shows one such street at peak traffic time of 5:30 PM. So concreted pavements are unnecessary in this locality. 2. Concrete pavements are not only unnecessary, they are actively harmful. Concrete and tar are the chief causes of a phenomenon called Urban Heat Island – the city is 4-5 degrees warmer than the surrounding space. It is better to have greenery on these pavements than concrete. 3. This is unnecessary expense, particularly if it is planned across the whole city. Cover drains that cause deaths in the monsoon. The attached sequence of pictures shows what the pavement looks like before, during and after concreting. Before concreting. Pic: G V Dasarathi. During concreting. Pic: G V Dasarathi. 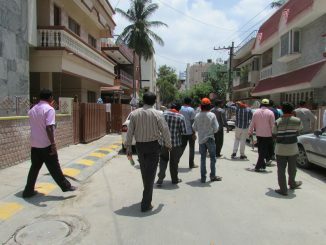 The streets in the locality have sparse vehicular and pedestrian traffic, and pedestrians now walk on the edge of the road comfortably. Pic: G V Dasarathi. It was not just an exhibition of dolls. This recent event in Bengaluru also conveyed the story behind these handcrafted figurines. Bengaluru audience got a glimpse of various forms of folk theatre. What can be done to make it more popular? BBMP seems to think every inch should be filled with concrete. There is no need for that; they can leave some space for water to seep in and leave space for trees to grow. This is the new-found madness of BBMP. Just like putting up massive dividers in residential areas to make sure people cannot cross the roads (even when there is no traffic). I never had problems with my knees until I came to Bangalore. reason – Walking on the concrete pavements of Bangalore. I think the Babus of BBMP have their Brains stuck up somewhere else. I have never seen such unfriendly / uneven concrete pavements anywhere in the world. One can not walk on the pavements in Cox Town, Bharathi Nagar area because the pavements are badly laid. Most of the platforms in Cleveland town are used as urinals. one can not walk on the roads also because the pet dogs dirty the entire area with their faeces. No wonder Bangalore is becoming a S H I T capital from I T capital. Looks better and usable after concreting! Before concreting, it looks unusable anyway with the “greenery” on it.